Offered for sale in a popular residential location, close to primary and secondary schools, is this 3 bedroom semi detached family home, with a good size South facing private rear garden and ample off road parking. This gas centrally heated and double glazed property comprises, on the ground floor, dual aspect living/dining room, kitchen, breakfast room, and a utility room with downstairs toilet. On the first floor are 3 good size bedrooms and a family bathroom. This semi detached family home is situated in a popular residential area of Exmouth, which has a good variety of local shops, pubs and restaurants. Exmouth seafront has the much favoured marina area and the Exe Estuary. The coastline known as the `Jurrasic Coast` has many beaches including Budleigh Salterton, Sidmouth and Lyme Regis. Exeter is approximately 10 miles distance with mainline railway links and the International Airport. An L shaped dual aspect room with double glazed window to front aspect and double glazed patio doors opening to the rear garden. Coal effect gas fire set on an attractive mantle and surround, with gas back boiler which serves the central heating and hot water system. Central heating radiator. Coving to ceiling. Television point. Two double glazed windows to rear. Low level WC. Wash hand basin with cupboard beneath. Space and plumbing for washing machine. Heated ladder rail. Built in airing cupboard with shelving, currently housing the immersion water tank. Loft access, insulated and part boarded. Doors to bedrooms and bathroom. Double glazed window to front aspect. The bedroom is furnished with a range of matching wardrobes with hanging rails and storage. Central heating radiator. Double glazed window to rear aspect. Built in cupboard. Central heating radiator. Picture rail. Double glazed window to side aspect. Picture rail. Obscure double glazed window to rear. Panelled bath with shower over and shower mixer tap. Low level WC and wash hand basin set in a concealed unit with storage above and below and plinth lighting. Heated ladder rail. Complimentary wall tiling. 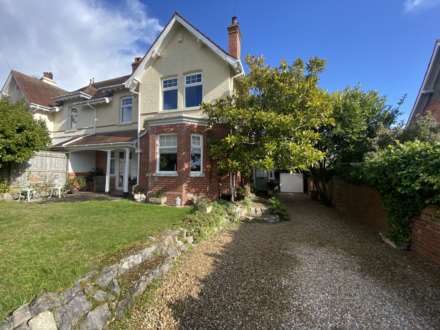 To the front of the property is a generous size low maintenance front garden which is predominantly laid to shingle, with a driveway providing ample off road parking. A timber garden gate to the side giving access to the rear garden. A feature of this property is the large private southerly facing rear garden. There is a patio area immediately adjacent to the property being ideal for out door dining and sitting during fine weather. Steps lead up to the remainder of the gardens which consists of a further patio area and the remainder being laid to lawn, with mature shrubs and trees providing year round interest and colour. Outside water tap. Summer House. Two garden sheds. Greenhouse. From our prominent Town Centre office, continue down Rolle Street, past The Strand Gardens and at the roundabout, turn right onto The Parade and into Exeter Road. Turn right into Withycombe Road and at roundabout turn left. Continue straight ahead at the next roundabout into Withycombe Village Road and take the 2nd right into Moorfield Road. Take the 5th right, passing Marpool School, on the right into Colleton Way where the property will be found on the left hand side.